WAKEFIELD, Mass. 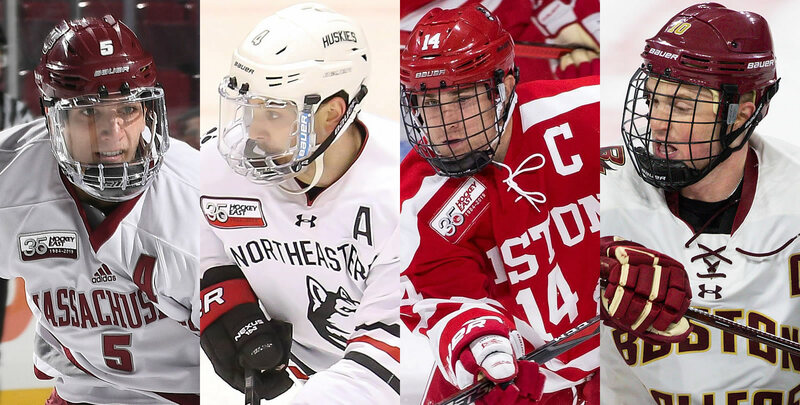 - The Hockey East Association has announced the pairings and start times for the 35th annual championship weekend, set for March 22-23 at TD Garden in Boston. The semifinal double header will begin Friday with No. 3 Northeastern and No. 5 Boston University facing off at 4pm, while No. 1 Massachusetts and No. 7 Boston College take the ice at 7:30pm. The winners will move on to the championship game on Saturday at 7pm. Both semifinals and the championship game will be shown live on NESNplus and streamed online at FloHockey.TV outside of New England. No. 1 Massachusetts (28-8-0, 18-6-0 HEA) advances to the TD Garden for just the fourth time in program history and first since 2007. The Minutemen have appeared in one title contest falling to Maine, 2-1, in triple overtime in 2004. After claiming its first-ever regular season crown in program history, UMass swept New Hampshire (5-4 2OT, 6-0) to win its first two Hockey East Tournament quarterfinal games since 2009. In three of the four years Massachusetts has advanced to the semifinals, the Minutemen have swept the quarterfinal series at home (2004, 2007.) No. 7 Boston College (13-21- 3, 10-11-3 HEA) moved past Providence (4-5 OT, 4-3 OT, 2-1) in a three-game road set as the Eagles become just the third seven-seed to move onto the semifinals (Vermont, 2015; Providence 2012.) Boston College is making its 25th trip to the final four in the Hockey East Tournament, the most of any school and matched only by Boston University. All-time in the Hockey East Tournament, Boston College owns a 8-1 mark against Massachusetts including four quarterfinal round sweeps. The teams have never met in the semifinals. No. 3 Northeastern (25-10-1, 15-8-1 HEA) meets No. 5 Boston University (16-17-4, 12-9-3 HEA) in the semifinals for just the second time in the programs' histories (1994.) The Terriers toppled UMass Lowell (2-0, 4-6, 4-1) at the Tsongas Center in a three-game set, marking the first time the Terriers have won a quarterfinal road series since 2004, while Northeastern took down the sixth-seed Maine Black Bears (2-1 OT, 2-1) on home ice. In 12 prior meetings in the Hockey East Tournament, Boston University owns an 8-4 record against Northeastern, most recently sweeping the Huskies in the 2017 quarterfinals. Northeastern carries a 2-8 mark in 10 trips to the semis, winning the Lamoriello Trophy in both years in which the Huskies advanced to the final (2016, 1989.) All-time, Boston University carries a 12-12 mark in the semifinals, and a 9-3 record in the title game. Last season, BU won its ninth tournament crown in program history, shutting out Providence, 2-0, in the championship match. The winner of the Hockey East Tournament will earn an automatic qualifier into the 72nd annual NCAA men's ice hockey championship tournament and have a chance to reach the 2019 NCAA Frozen Four held in Buffalo, New York. The Boston University Terriers won their ninth Hockey East Tournament title in program history last season, defeating the Providence College Friars, 2-0.